The Sesame Street Learning Town is a unique inflatable playground that will allow for hours of playtime fun. This inflatable bounce house is designed for ages 3 to 5. A fantastic Elmo entrance takes kids under a Sesame Street sign, where a swinging Grover center door greets them, while three-dimensional components like Oscar the Grouch, a flower and a phone booth round out the theme. 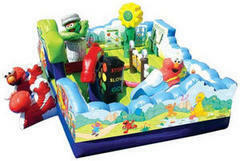 The Sesame Street Learning Town inflatable play structure is part of an exciting line of toddler inflatables Let's Jump. INFLATABLE ONLY, NO GAME ACCESSORIES INCLUDED!